Noor-Ghani Dispute. 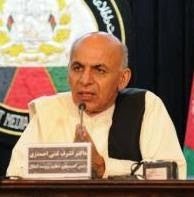 The dispute between President Ghani and Governor Noor has receded from the front pages but it is not likely over. Noor is positioning himself for a run for the presidency while Ghani tries to maintain his political apparatus for his re-election. The TAPI project, potential peace negotiations, and start of the fighting season have pushed the Noor-Ghani drama to the sidelines but it isn't over. Turmoil Within Hizb-e Islami. The leaders of an Afghan Islamist political party are in a state of disagreement. Read "Leadership Divide Threatens Afghan Islamist Party", Gandhara, March 14, 2018. Mattis-Ghani Meeting. During his brief visit to Kabul Secretary of Defense James Mattis visited with a host of people to include Resolute Support leaders and staff, embassy personnel, and President Ghani. Not much news came out of the visit with Ghani. The U.S. once again affirms its support to the Afghan government and cautions the Taliban that peace negotiations is the only way to end the conflict.